We are now offering Beaming White teeth whitening at Beauty Hideaway! It’s a safe and effective alternative to sometimes painful dentist office whitening. 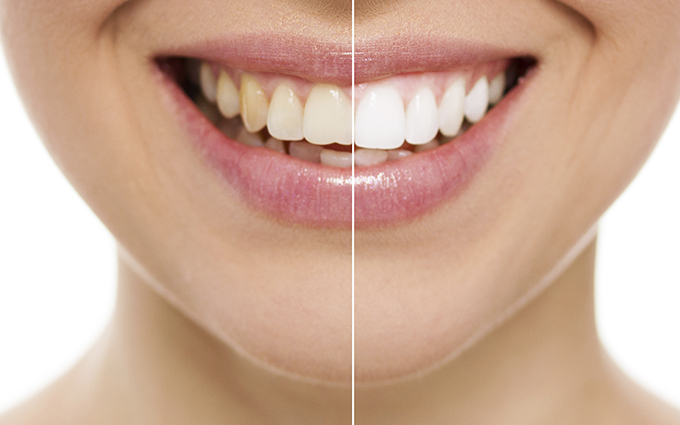 Beaming White is one of the largest manufacturers of professional in-office and teeth whitening treatments. Their products are manufactured in the United States, are 100% vegan friendly and formulated with kosher ingredients. The biggest difference is that dentist’s gel is usually stronger (typically 25% hydrogen peroxide vs. Beaming White’s 16%). If you ask around to those who have undergone dentist-performed whitening, stronger is definitely not better all of the time, as many people report tooth pain and severe sensitivity afterward. In fact, many dentists are no longer offering teeth-whitening treatments due to the pain that many clients experience during and after the treatments. Aside from the higher level of hydrogen peroxide, the main difference is that dentists are allowed to apply (paint) the gel on your teeth. Non-dentists must have their clients apply the gel. We have observed that this part of the process is actually fun for many of our clients. Naturally, the higher percentage of peroxide and the dentist’s time equates to a higher price. Our Beaming White treatment is a fraction of the cost of theirs ($600 vs. $150) all while producing the same results! Having your teeth whitened at the dentist’s office is like any dental treatment inside a loud, cold and bright environment. Whitening sessions at Beauty Hideaway are done in our massage room with soft music, aromatherapy, candles and a heated blanket (an hour of bliss for most actually). The results from either setting will last for 6 months to one year depending on how you treat your teeth. Dentist offices will typically upsell expensive and time-consuming take-home trays for maintenance. We’ll encourage you to get our favorite Daily White Fusion cleaning and whitening form (because it is quick, tastes great and keeps my teeth white). Sessions are roughly one-hour in length and $150. For a very limited time we are offering our Facebook Promotion for $49! Call 949-916-7995 now to reserve your spot!